A Russian company indicted by special counsel Robert Mueller pleaded “not guilty” in federal court on May 7. Lawyers for Concord Management and Consulting, LLC also demanded a speedy trial and said they intend to invoke “discovery” to obtain U.S. intelligence about what the agencies knew of Russian activities in the “collusion” case, The Daily Caller reported. Concord’s moves were the second legal headache for Mueller in two weeks. Last week, federal Judge T.S. Ellis threatened to throw out the special counsel’s indictment of former Trump campaign manager Paul Manafort. On Feb. 16, Mueller indicted Concord along with two other Russian companies and 13 Russian nationals. The 13 Russian individuals were charged with waging “information warfare” in the United States, interfering with the 2016 presidential election, and conspiracy to defraud the United States. Mueller “may now have to try the case, and Concord’s lawyers have put the special counsel on notice,” Pollock wrote. Mueller had tried to delay a May 10 hearing, claiming Concord had not been properly served notice. “Until the Court has an opportunity to determine if Concord was properly served, it would be inadvisable to conduct an initial appearance and arraignment at which important rights will be communicated and a plea entertained,” Mueller’s lawyers filed in federal court. Concord opposed the motion. 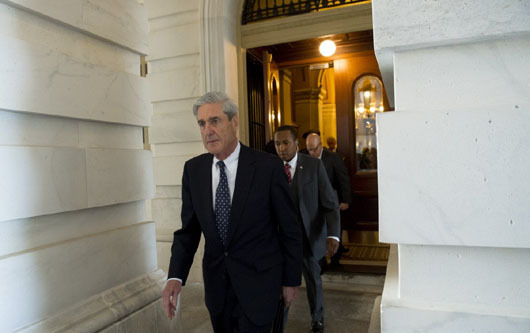 “The Special Counsel is not entitled to special rules and is required like the Attorney General to follow the rules of the Court,” Dubelier stated in his response to Mueller. U.S. District Court Judge Dabney Friedrich agreed with Concord and rejected Mueller’s request for a delay. The case will resume July 9.